Angela Belt is the Visual Merchandiser for Room & Board in D.C. and a freelance stylist at AngelaBelt.com. A graduate of Howard University with a degree in Fine Arts, Angela has over nine years of styling experience including work on residential, commercial and outdoor projects. 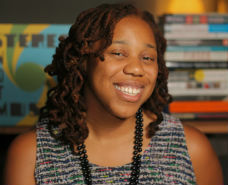 Angela Belt is the visual merchandiser for Room & Board in D.C. and a freelance stylist at AngelaBelt.com. A graduate of Howard University with a degree in Fine Arts, Angela knows a lot about making your interiors look good. We have asked for questions about one of her specialties - outdoor furniture and creating outdoor furniture rooms - but she can solve a lot of your decorating dilemmas. Let's go. Good Morning! Memorial Day has officially passed, so it is officially summer time. My name is Angela Belt, and I am the Visual Merchandiser for Room & Board in DC. I am here to answer all of your outdoor questions, and get you ready for your next outdoor party! Hi there! Posting early because I love the outdoors! My partner and I are redoing our patio before the big summer season, and we are including a private area for the late night parties and other activities in addition to a dining area and cooking area with grill. We have selected our stone and patio pattern, but are wondering if it might be a good idea to sound proof the private area so the noises don't disturb our neighbors. Is this something that can be done reasonably inexpensively yet still attractively? Thanks! I think a really good solution that is stylish and inexpensive is deck tiles. They are sold at Home Depot, and lots of other retailers. They are an inexpensive and stylish flooring solution that may help with sound problem, and also look good in your outdoor space. When in doubt with noise, bring your neighbors a bottle of wine in advance, and ask them to please pardon the noise. Is it wise to close off a patio to the outdoor elements, for instance, with folding sliding doors? Does it reduce or add value to a home? I think if you are going to close off your patio space due to the winter elements, really invest in a good door. One that not only is functional, but will add aesthetic value to your home. I wouldn't go with the inexpensive sliding door solution, because in the long run you may end up having to remove it if you are thinking of selling your property. Q: Outdoor vinyl siding and hanging artwork? Absolutely! You may need to reach out to your local hardware store to find out the right anchors for your wall due to the texture, but it really adds a nice layer to the outdoor space. In our R&B showroom in DC, we have bird planters hung on a brick wall year round outdoors, and it looks great. Today's article on 50 years of Marimekko has brought out a lot of great memories of Marimekko dresses, sheets and stretched fabric panels in college dorm rooms. Email me your Marimekko Memories at konciusj@washpost.com or message me on twitter at @jurakoncius with hashtag #marimekko. Send photos if you have them. I'm in the market for a new sofa, something contemporary with flair arms. Where can I purchase a sofa with acrylic outdoor fabric? I would look for at a sofa like Room & Board's palm sofa, that has high tuxedo arm, and a contemporary look.In general outdoor furniture and fabrics has seen a huge revolution over the past ten years. Anything in Sunbrella fabrics will work on an outdoor piece of furniture. Room & Board also has a large variety of their fabrics to sample. It seems that the very dark outdoor plastic woven furniture so popular now would be very hot when left in the sun. And white woven furniture would get dirty from pollution. Can you suggest a source that has other colors (for example, gray) for woven outdoor furniture? Thank you. Yes, woven furniture is very trendy right now indeed. At Room & Board we sell a woven chair called Penelope. It only comes in black and white, but, believe it or not, the plastic doesn't heat up that much because it is xiloplast weave plastic, which is far more durable and resistant to hear. However, if you are looking for some colorful options, West Elm's Huron lounge chair is a nice option. It has great color, high back, and comes with an ottoman. Hi Angela, I love the idea of outdoor pillows, but can they be left outdoors in the elements all the time? I get this questions a lot, and normally I would say yes. But I think with the type of winter we had this past year, I have been recommending to a lot of clients to bring a lot their outdoor decorative item indoor in late fall. I think if you live in an area like the West Coast, by all means keep the pillows outdoors, all the time. Q: Low maintenance quickie ground cover ideas? I have some areas in my backyard that I'd like to get covered with some kind of ground cover / foliage as soon as possible (to avoid getting weeds). Can you recommend some low maintenance plants for that purpose? I don't care what they look like as long as they are easy :). Stone crop is a really good solution (and FYI it also looks really good). It is low maintenance, and it grows like crazy. Here at Room & Board we work landscape designer Derek Thomas, and it is definitely a plant he would recommend. My one caveat, is that is grows fast so make sure you maintain it. What is the difference between outdoor and indoor fabrics, furniture, and rugs? Is there any reason why the products marketed for outdoor use can't be used indoors? Thanks. Over the past decade there has been a revolution in outdoor fabrics, rugs, and furniture. What's great is that now what you see outside, not only looks good but it is durable enough to live inside and/or outside. The bigger difference with outdoor fabrics is the way they are treated to withstand the elements. The vendor Sunbrella, who Room & Board partners with is a leader in outdoor fabrics. They actually offer outdoor velvet now. Outdoor rugs it's the same thing, at Room & Board, we have a new Cyclo rug, which is made out of recycled tires. It's a great outdoor and indoor solution. So really no difference anymore, you can use outdoor products indoor, and its great if you have kids and/or pets. For the person who asked about closing off their patio, I'm not quite sure what elements they are referring to (cold, rain, both? ), but we have a screened-in porch and I cannot tell you how many people with open decks have told me they wished they had one as well. With the mosquito situation around here, it makes it possible for me to sit "outside" much more than I would otherwise. One option (this is not freestanding) is Loll's Go Porch swing. It comes in a lot of different colors and options. It is very modern and playful. Q: repair/reseal a front door in one day? Hi. Our front door was replaced 9 years ago and the finish has worn off in several places. It has been noticeable for several years so I am not sure if there has been damage. The door is covered by a front porch. How can we get it fixed and still have a front door? The logistics are stumping me. Thank you. Unfortunately, what is going to happen is that they are going to need to remove the door, and most likely a board will be put in place to cover the entryway so you will not have to worry about the outside elements coming inside. The good thing is that a job like this could be done is day or max a few days, so in the long run it would be a minor inconvenience. I hope you have a back door. Q: How does a person find a good landscaper? I know that recommendations from friends are best, but all of my friends are apartment people. I tried Angie's List but I do not think the reviews are genuine (long story). So, how do I find a good, honest landscaper? I would recommend the landscaper we work with, Derek Thomas. He does residential and commercial properties throughout DC. If he is not available, he can absolutely point you in the right direction. His website its thomaslandscapes.com. I have standard sliding glass doors to my backyard / patio. I would like to let in more light, yet I still need to be able to go in and out. What would you suggest? Well the real question is are you interested in demo work, or an easy fix? I think if you want to get more space you may need to turn that entire wall where your sliding doors are into floor to ceiling windows. This would absolutely let in more light, and create a nice cohesion between your outdoor and indoor space. My "left outside 'cuz it will be fine" outdoor café style table, chair and bench have turned black from the original verdigris copper look. Just soap and water didn't do it. Suggestions? Love reading almost everything you all write about in Home Front, BTW. I think I am a closet homebody who works too many hours. Oh I'm so sorry to hear that! I think this winter has done a dozy on a lot of outdoor spaces in the area this year. I would suggest two products from Home Depot that might work Spray & Forget or Mold Armor. However, depending on how long they were out there, it might just be time for a new cafe set. I hope one of these two products works. I am the person that asked about plants - thank you for the tip on stone crop! :) I will definitely try it. Q: re: "a private area for the late night parties and other activities"
I was going to say that the best way to avoid neighbor complaints is to bring them in on the party, but this sounds like a different kind of party. Maybe cork tiles on the walls? Great chatting with you today, Angela. Thanks to all for your questions. Jura and Angela, We recently built a new deck here in DC and we would like to purchase a modular couch for it. Do you have any recommendations regarding a particular brand/maker?